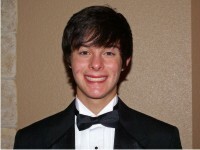 Matthew Bruemmer is currently a student attending Southern Methodist University in Dallas, TX. His composition instructors include Brian Nelson of Trinity University and David McCutchan of Ronald Reagan High School. Matthew was a self-taught composer for six years prior to beginning his formal studies.. This method of learning has made him appreciate the art even more. Matthew's influences are Philip Glass, Gustav Mahler, Johannes Brahms, György Sándor Ligeti, George Crumb, and Thomas Adès. Matthew has received ASCAP recognition for a string quartet entered in to the Morton Gould Young Composers Contest. He received first place in the digital category of the NASA Art Contest two years in a row for orchestra pieces. Matthew's composition portfolio includes over fifty works.